Risk factors (Faza 2013, Moreillon 2010). Can also present with pneumonia. Seen in 5-15% of IE patients. (Gomes 2016). Painless hemorrhagic lesions on the feet and hands Marrie 2008. Caused by septic microemboli to skin with dermal microabscess formation Gomes 2016. 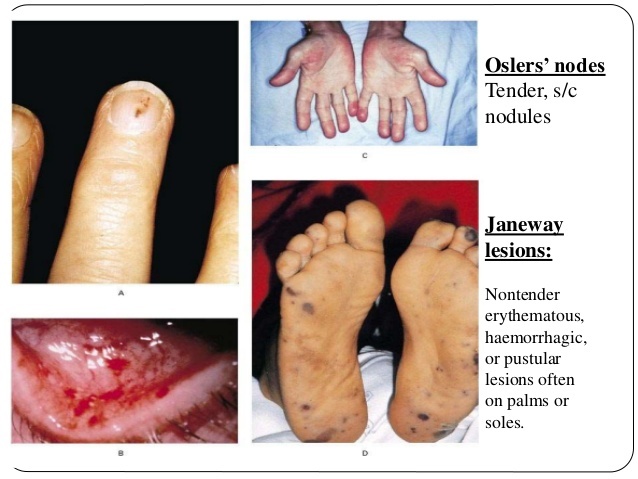 Tender nodular erythema in the pads of the fingers and toes, thenar eminences, sides of the fingers, and the skin of the lower part of the arm Marrie 2008. Much of the literature reports that these lesions are due to immune complex deposition (Aretz 2010) or allergic vasculitis (Moreillon 2010), but more recent literature suggests etiology may also be microemboli and microabscess formation Gomes 2016. Local pain usually precedes the appearance of lesions by a few hours. The nodes may last from a few hours to several days, and leave no sequelae Gomes 2016. 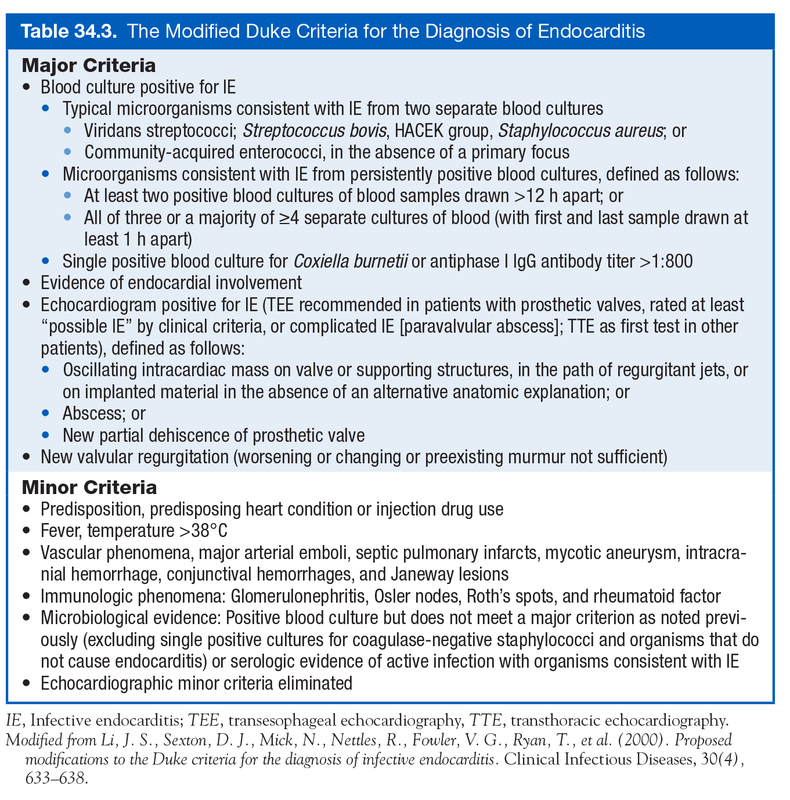 Seen in bacteremia without endocarditis, infected intravascular graft and in systemic lupus erythematosus Marrie 2008. 3 sets of cultures should be obtained. Other causes include fastidious organisms (HACEK group, Legionella, Chlamydia, Brucella, certain fungal infections, etc.) and noninfectious causes. HACEK = Hemophilus spp., Actino- bacillus spp., Cardiobacterium hominis, Eikenella corrodens, and Kingella kingii. Definition: Slow- growing gram-negative bacilli can require several weeks before they are detected in culture. 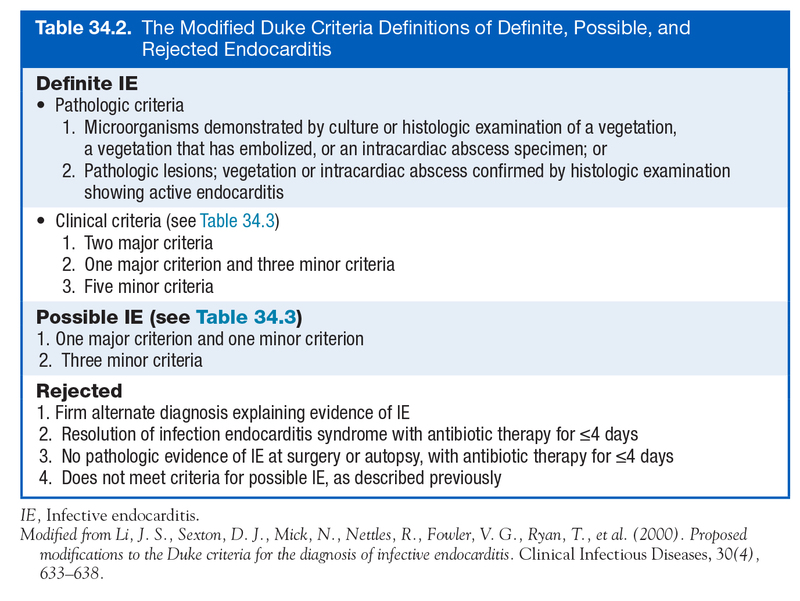 Comprised 1-3% of all IE cases, with a mean delay in diagnosis from 1-3 months Revest 2016. Part of normal oral microbiota (some are also urogenital) Revest 2016. Some sources suggest that in uncomplicated NVE with normal renal function may need antibiotic for as little as 2 weeks. Cahill 2017. Admit for IV antibiotics. Early surgical consultation.